When it's been awhile since you last watched a K-drama you tend to forget many of the major plot details of its story; what you do remember are little intimate snapshots from the drama that touched your heart; for instance, for this beautiful drama Heartstrings (2011) I had images from unforgettable scenes implanted in my memory: two men sitting by a window playing their guitars while the sunlight streamed in, a love necklace being thrown onto a rolling green lawn, two hands reaching out to feel the rain, a cappuccino cup sitting on a high ledge waiting to be picked up, a young man struggling with stage fright, someone writing musical notes in a journal before he dies, a mother looking lovingly over her sleeping son, an old man telling a younger man about his youth, a ballerina falling while dancing, a young man standing on a Jeju Island lighthouse looking out at the sea and then taking a picture of the back of a young girl running away, a student visiting her beloved professor in the hospital who is dying of cancer, a best friend always running into love scenes and interrupting the couple who are trying to kiss, a lovely bike ride in the sun with CGI hearts falling all around. So to remind myself of the full story flow of this drama I re-watched it before I wrote this review and I ended up loving it more than I did the first time! The performances are all superb, the love stories very touching, and the music score is outstanding, even better than the score for You're Beautiful because it has many gorgeous love songs in it which you can't get out of your head once you've listened to them. Some of them reminded me of the lovely score for the Korean film The Classic (2003), which also was unforgettable. In fact I ended up appreciating Heartstrings so much more the second time around that I am moving it up a few notches in my Favorites list. Heartstrings originally had a working title of "Festival" until the Korean station MBC held a contest for fans of the stars in the show who were asked to submit possible alternate title names. They came up with the title You've Fallen For Me from a line in the show where the lead male character tells the lead female character how to deal with stage fright effectively: look the audience straight in the eyes and repeatedly chant silently to yourself, "You've fallen for me! You've fallen for me!". However, when it came time for the drama to be released in the United States the website which streamed it held their own title naming contest and the top pick for the new title was Heartstrings, which I think is a much better title, because the lead couple each play different stringed instruments: he plays Western style music on his guitar, she plays antique Korean folk music using an old stringed instrument called the gayageum, so the symbolism behind that title clinches the main theme of the show: two people who both play stringed instruments, coming from widely different backgrounds and music perspectives, who at first mistrust one another but who ultimately come together as One. Popular actress Shin Hye Park plays Gyu-won Lee, a happy, high-spirited young lady who attends a prestigious college for the performing arts, playing the gayageum in a music quartet with her close friends, including her favorite, the bubbly Bo-woon Cha (Se-mi Im). She lives with her crotchety old grandpa Dong-jin Lee (played by the wonderful character actor Goo Shin from Thank You, I'm Sorry, I Love You, and Ruler Of Your Own World), who was considered one of the top traditional music Korean singers in his day. He is very strict with her, to counterbalance the long-distance relationship she has with her father, Sun-ki Lee (Jae-deok Sunwoo), who was forced to give up custody of her because of his itinerant lifestyle. Gyu-won stays in touch with her father via cell phone and once in awhile secretly sees him while he's in town. Her mother had passed away when she was young. She can also sing very well but lacks confidence in that area. A college professor who sees a lot of promise in her becomes like a second father to her, a former Broadway producer turned college drama teacher named Suk-hyun Kim (handsome Chang Ui Song), and he encourages her to stretch her wings and try other forms of entertainment besides just the gayageum. When she has sadness in her life, like losing her long time music teacher to cancer, he's there to comfort her. Who among us doesn't remember a special teacher who went above and beyond the call of duty to encourage us to heal from life's sadness and excel in our chosen field? CNBlue lead vocalist and guitarist Yong-hwa Jung, who made his acting debut in You're Beautiful playing the second male lead, here in Heartstrings plays the lead male character Lee Shin, top musician in the rock group The Stupid, attending college at the same performing arts college as Gyu-won. He is wildly popular because of his nightly gigs at the campus' nightclub The Catharsis. He has too many fangirls in his life; they scream and follow him around all day exhibiting cult-like characteristics which try his patience. He lives with his beautiful professional writer mother Ji-young Song (classic beauty Il Hwa Lee who played Se-mi's mother in My Love From Another Star), and his younger sister Jung-hyun (Ga-young Moon). He loves them and is always there for them in a family crisis. He never really knew his father until one day his mother asks him to visit a legendary guitarist who is in the hospital dying of alcoholism and who would like to meet him. She doesn't inform Lee Shin that this man, Hyun-soo Lee (Beom-seok Seo in an exquisite performance) is his father, but he begins to suspect it immediately when they meet for the first time and begin to play lovely, flawless guitar duets together. (These scenes always brought hot tears to my eyes, they were so incredibly poignant). Lee Shin has another reason to be sad: he is secretly in love with a dance teacher at the college who had an ankle injury which had sidelined her professional career as a top ballerina, Yoon Soo Jung (played by one of my favorites, Yi Hyun So from Who Are You? and I Hear Your Voice). It's an unrequited love affair though because Yoon Soo has been in love with Gyu-won's favorite teacher Suk-hyun for many years and when he returns to the college from Broadway the two of them start to rekindle old feelings, leaving Lee Shin watching from the sidelines with painful frustration. He tries to win her heart but everything he does fails, including giving her a beautiful necklace and a kiss for her birthday. Yoon Soo only has eyes for Suk-yeon and she has to finally be brutal with the younger man by insisting he give her up and find someone closer to his own age. A musical rivalry begins between Lee Shin and Gyu-won stemming from a misunderstanding which developed after Lee Shin missed a charity music gig to help pay the hospital bills of her music teacher who had cancer. His little sister had developed appendicitis so he had missed the gig, a fact which he doesn't tell her, so she just thinks he is lazy and doesn't care; she in turn doesn't tell him she is mostly upset because the teacher had just died. Out of their argument they make a bet with one another, to hold a music contest showcasing new music versus old music and whoever loses the vote has to be the personal slave of the other person for a full month. The contest seems to be leaning in Gyu-won's favor when all of a sudden one of the strings breaks on her gayageum and the votes all go to Lee Shin by default. Lee Shin quite enjoys this turn of events, telling her to bring him coffee every day, to clean up his band's practice room, to find a lost necklace in a huge rolling lawn (the necklace he had tried to give Yoon Soo on her birthday). Gyu-won unhappily finds that the more she spends time with the arrogant Lee Shin the more she feels attracted to him. Eventually Lee Shin discovers that he admires her pluck and good spirits in the midst of being teased by him almost constantly. When Gyu-won finds the necklace and gives it back to Lee Shin she says to his face that she doesn't like him, but soon thereafter as both music groups begin to spend fun time together eating out and going to karaoke, Lee Shin picks a moment during a fireworks display to tell her not to dislike him anymore, and he begins being kinder to her. When she is injured and spends time in the hospital he is there every day and even takes lessons from her on traditional music. Eventually both music groups, the rock group and the traditional music group, discover that they actually sound amazing when they combine their styles together! For the college's 100 Year Anniversary the school decides to put on a blockbuster musical show and auditions are held. Gyu-won sings opposite a chief rival for the lead female part, the petite anorexic Hee Joo Han (Ri Woo), but since Hee Joo happens to be the college president's daughter she wins the judges' vote count due to pressure being put on the panel and the drama department chairman, Tae Joon Im (Jung Hoon Lee), by Hee Joo's pushy stage mother. Gyu-won is given the understudy role, much to her misgivings. A young man who had dropped out of the college due to severe stage fright when trying to perform, Gi Young Hyun (Hyun Jin Lee from Operation Proposal) is encouraged to come back by drama teacher Suk-hyun and he wins the male lead part; but what will happen on opening night, will he freeze up again in front of the audience and ruin the show? Will the anorexic Hee Joo be able to perform or will Gyu-won have to go on in her place? Heartstrings breaks some traditions for musical shows of this caliber. Most of the heavy heartbreaking scenes occur in the beginning and middle parts of the show; in the last part of the show the main stresses come from performance and personal troubles among the college cast related to putting on the big anniversary show, as well as staff politics when the drama chairman conspires with Hee Joo's rotten mother to try and get rid of Gyu-won, but there really aren't anymore heartbreaking scenes like earlier in the show. Some friendships are strained for awhile and new alliances are made. They cut to a year after the show to see where all the people are with their relationships after time had passed. Another tradition broken with this drama is the fact that the grownups in the show get as much attention paid to their lives as the kids do. That's smart, because it appeals to the young people and the more mature audience members as well. Along the way, though, there are many delightful moments as well. I particularly loved the funny character of Joon-hee Yeo (played by Min-hyuk Kang who is the real life drummer of the group CNBlue and who also appeared as a bright student in Heirs, a role for which he won the SBS Drama Awards Best New Actor Award). 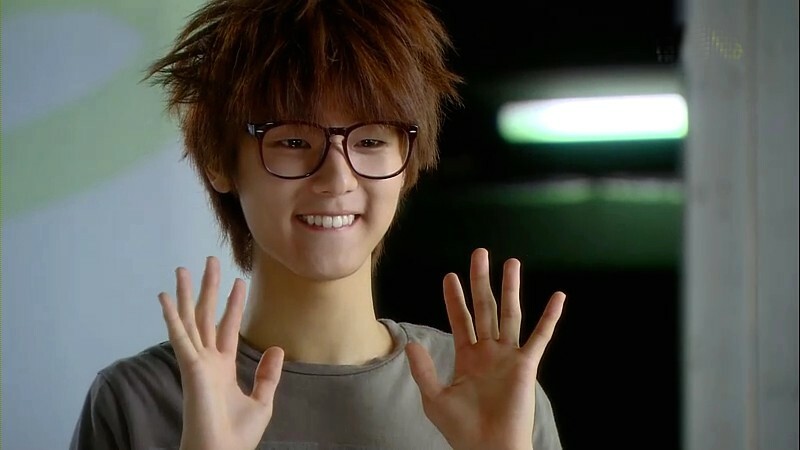 With his bushy hair and big glasses and his soft high-pitched voice, he was simply adorably perfect as comic relief. I loved the song he sang in the show, Star. I thought to myself, "Wow! A gorgeous voice coming out of a young person like that? Amazing!" I wanted to kidnap him out of the screen and hug him. Just too cute for words! He falls for Hee Joo in the show, and calls her his "Natasha", though what he sees in her hyper, selfish character I confess I am unable to see. Love is blind? 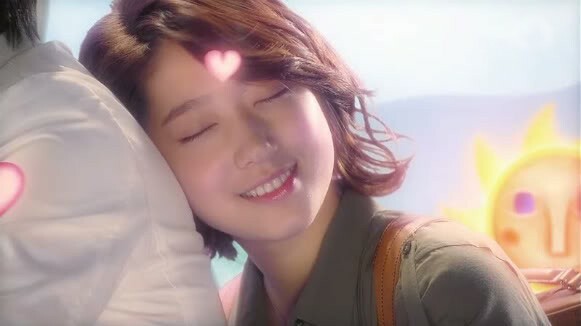 Shin Hye Park and Yong-hwa Jung strengthened their chemistry in Heartstrings that they displayed earlier in You're Beautiful. I would love to see them cast in another K-drama someday. This is definitely my second favorite performance from Shin Hye Park after her brilliantly unforgettable one in the tragedy drama Tree Of Heaven. Don't miss it! My strong recommendation is to buy the DVD boxset on Region 1 on Amazon: you will get the best picture and audio quality and the best English subtitles. There's no substitute for a totally legit DVD release .... until someone in Korea wises up and starts to release these outstanding dramas on Blu-ray.